No more queues at a railway station for making a booking on Indian Railways. Indian Railways have launched a mobile website that can be access from any basic mobile phone with GPRS. IRCTC (Indian Railway Catering and Tourism Corp), which is Indian Railways’ online ticket booking system, now has a mobile companion website where you can book your tickets using your mobile phones. “IRCTC mobile website is convenient and easy to use, and can be accessed from any browser enabled mobile having basic GPRS activated on phone,” says an IRCTC statement. Not only will the mobile website allow users to enquire and book tickets, it will provide booking history. Just like the main website, the mobile site also offers the ability to cancel any of the tickets booked. Tickets can be bought using your credit/debit card for payment. Passengers can even check their PNR status on their mobile phones. Passengers can use their existing IRCTC user id and password on mobile website and fill in details of travel. You can also update your mobile number in IRCTC profile to receive SMS alerts for your ticket booking. Taking full advantage of the digital technology, Indian Railways have also removed the need to print your e-ticket. Virtual Reservation Message (VRM) – A screen-shot of the e-ticket displayed through laptops/palmtops/ Mobile phone is now accepted as proof of ticket by Indian Railways. The VRM along with an ID proof in original and the indication of the passenger(s)’ name(s) in the Reservation Chart will authorize the passenger to travel, says Indian Railways website. VRM will also authorise the passenger to enter the platform on the day of journey and will not be required to purchase platform ticket. Taupo is not really one of the most favoured destinations with New Zealand and international travellers and holidaymakers. That honour goes to Queenstown in South Island. However, Taupo is North Island’s Queenstown. With Lake Taupo spreading across 616 square metres (that’s the size of Singapore), Taupo offers views, quiet accommodation and tourist-friendly cafes. Taupo is less than 300kms from New Zealand’s main airport – Auckland and with New Zealand’s modern road network, the trip takes only three and a half hours, along picturesque landscape of North Island. An international traveller can either drive non-stop to Taupo, or stop on the way and enjoy many options that New Zealand offers. Hamilton has one of the country’s largest gardens – Hamilton Gardens, with Paradise Garden Collection, and Te Parapara – New Zealand’s first traditional Maori garden. Before starting your journey, look up the garden’s website for one of the many exciting events staged here each year. Hamilton Gardens opens at 7.30am every day of the year. For Indian visitors, there’s a surprise – Indian Char Bagh Pavilion within Hamilton Gardens. Char Bagh’ or ‘enclosed four part’ garden offers a colourful display of flowers spreading out from a distinctive chalk coloured Pavilion. This form of garden spread throughout the Muslim world between the 8th and 18th centuries. The complex symbolism behind this form of garden has its very ancient roots in three of the world’s great religions – Islam, Hinduism and Buddhism. You can easily get enchanted and lose track of time and the journey ahead while at Hamilton Gardens, where you can easily spend the whole day. The next stop can be Cambridge – a lazy town of 16,000 people with a mixture of Kiwi and British feel in the air. Known as the town of trees, it offers a stunning range of exotic trees that add to the English-style town atmosphere. At Cambridge, you can walk the heritage and boutique trails and discover the beautiful range of shops many set within heritage buildings. The Tree Trail takes in the Town Square and the hidden treasure of Lake Te Ko Utu. Another nearby attraction is Maungatautari – mountain sanctuary for native wildlife only 15 minutes drive from Cambridge and now a beautiful home for reintroduced kiwi and other native birds. Visit their website for details. Then there’s Athenree Gorge (in the Western Bay of Plenty) on the way if you take SH2 route. Waihi beach too is on the way and is worth a stop. Once in Taupo, you can either get active and try many outdoor activities including horse riding, mini-golf, Segway ride or you may simply want to relax by the lake and finish your favourite novel. Most cafes on Roberts Street are lake facing, allowing you to take pictures of the lake on your mobile phone and upload them to Facebook using free wi-fi provided by the cafe. Unlike many smaller towns in New Zealand, Taupo offers you a choice of not one but three to four restaurants offering Indian cuisine, and it is difficult to pick one over the others. However, Indian Delights (10 Roberts Street) is located on first floor and offers fantastic lake views. 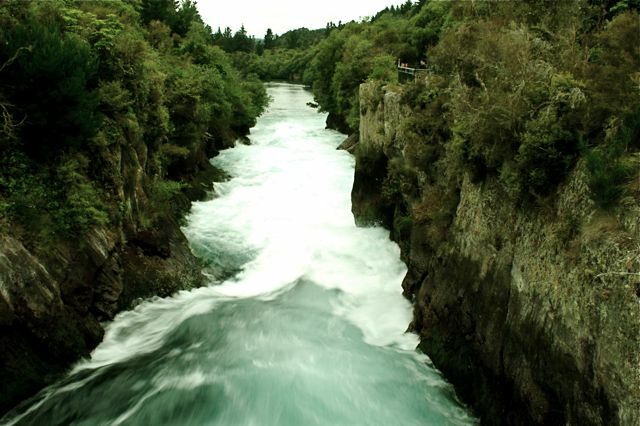 The famous Huka falls is just a five-minute drive from Taupo and provides jet-boating as well as prawn fishing attractions. 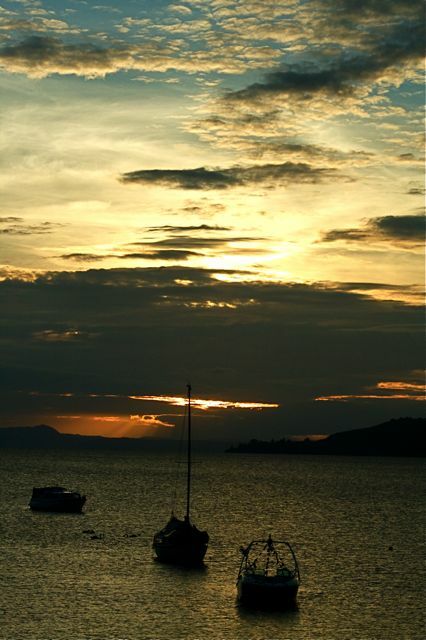 At Lake Taupo, on-water activities include banana boat ride, kayaking and para-sailing. But if you have had enough of water, then head inland to Craters of the Moon which is only a few kilometres from Lake Taupo. Here you can enjoy horse-riding where you are accompanied by one pilot horse in the front and one at the back, while you can choose the speed at which you would like to explore the forest around. Lake Taupo and its surroundings offer a perfect holiday destination for the whole family as well as for adventurous tourists. The recent incident in Auckland where a two-week old boy was seriously injured when his child seat came loose is a stark reminder of reviewing our child-safety, says a New Zealand charity. Plunket New Zealand is urging people to have their child car-restraints checked before the busy Christmas holiday season. Sue Campbell, Plunket’s National Child Safety Advisor says a car seat needs to be installed correctly for it to perform correctly in an accident. “The Christmas holiday period can be a busy and stressful time for parents and caregivers so now is a good time to check your child’s car seat – before we get into the silly season. “We recommend that parents and caregivers seek expert assistance from a child restraint technician for a free check to ensure that your child’s car seat fits your vehicle and is installed correctly. They can also advise about the best car seat for your child’s age and weight, and one that is best suited to your car. “Plunket has a Car Seat Rental Scheme which exists to help families get access to child car restraints. Our priority is keeping children safe so we’re flexible on payment methods but hireage is generally less than the cost of a takeaway coffee a week. Australian travellers may be left stranded at the airport holding bogus tickets at Christmas time after suffering at the hands of scammers. A government agency has warned Australians about cheap flight deals through fake websites which have travellers believing they have bought legitimate airline tickets. But all they have done is been skimmed of their money and left vulnerable to identity theft. The Australian Competition and Consumer Commission’s SCAMwatch website (www.scamwatch.gov.au ) has issued warning for flight booking scams. If you are visiting family over Christmas make sure you book your flights through a legitimate airline, flight booking or travel website, or a travel agent, the SCAMwatch says. SCAMwatch says it has received a number of reports of fraudulent traders who have copied the ABN and look of legitimate travel websites. “These fake traders claim to sell tickets on behalf of well-known airlines, when in fact the airlines have not authorised the sale. “After purchasing the fake tickets, victims are given a booking number but when they go to use this number they find that the booking doesn’t actually exist with the airline they are supposed to be travelling on. “Consumers may be contacted directly by fraudulent traders, or may follow links via popular social networking sites. Be cautious when deciding to purchase really cheap airfares – if it looks too good to be true it probably is. Check the ABN (Australian Business Number) quoted on a flight booking website is genuinely registered to the trader named on the website. You can look up an ABN on the Australian Government’s business.gov.au website. Agrees Graham Doessel, chief executive of MyCRA, a national credit repairer. “It’s all bad for these poor scam victims. At best they can be left with no holiday – but at worst fraudsters can take their personal details and use them to construct a fake identity which would allow them to borrow in their name – the ramifications of that can last for years,” Mr Doessel says. Currently the Australian Crime Commission sites identity theft as the fastest growing crime in Australia, and a recent study presented by the Attorney-General’s office revealed 1 in 6 people have had their identity stolen or misused in some way. The Australian government offers this advice. The flight booking website is not well-known, or you have never heard of it before. The website claims to offer flights at unusually cheap prices, some up to 50% off. There is no Australian contact number or address for the trader, often because they are not located in Australia despite their claims. The site does not have a valid Australian Federation of Travel Agents membership number. Be cautious when considering whether to purchase really cheap airfares – if it looks too good to be true it probably is. Check the ABN quoted on the website is genuinely registered to the trader named on the website. You can look up an ABN on the Australian Government’s business.gov.au website. The Indian High Commission in New Zealand is about to implement the online visa scheme. From 30 May 2011, the high commission in Wellington will accept only online visa applications. “After this date, the High Commission will not accept manual, handwritten or typed visa applications,” says the high commission. Visa applicants can submit their applications at secure website here. Once the online application is lodged, the applicant can print the online form and send it to the high commission with required documents. For more info on Visa please visit the High Commission website. Media reports that Australia’s Qantas Airways is planning to move its operations to Asia have met with strong reaction from the Australian community, and unions are threatening industrial action. Australian and International Pilots Association has warned that any move by Qantas to shift operations offshore and set up a premium airline in Asia will provoke a community backlash. The Association president Barry Jackson told The Australian that reports that Qantas wanted to base much of the airline in Asia would set off alarm bells in the community. “Australians want Qantas, not ‘Qantasia’,” he was reported in the newspaper. In the meantime Qantas said the media reports that it was setting up a premium airline in Singapore were “purely speculative” and no decision was reached. 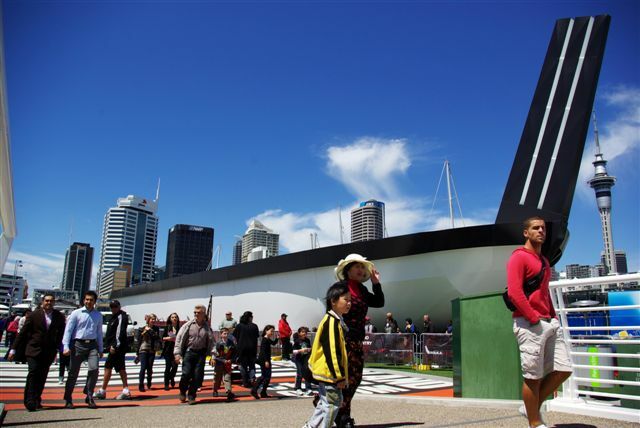 Australia’s flagship carrier has denied media reports that it was seeking a licence to operate an airline in Malaysia. The airline told a news agency that it was looking at options to strengthen its struggling international operations. Qantas is facing competition in the premium segment from Emirates and in the cheap airfares segment from cheaper airlines. Earlier, the Australian Financial Review reported that Qantas was considering setting up a full-service airline in Singapore where up to 20 aircraft could be based. Qantas intends to challenge the market share of Singapore Airlines and Cathay Pacific in Asia and build its network in Europe, the newspaper said. Qantas already operates a low-cost carrier, Jetstar Asia, in Singapore. In the meantime, aircraft engineers have called off plans to strike but there are plans for further industrial action. As if to compound its difficulties, the Australian carrier has been slapped with a NZ$6.5 million fine by the New Zealand High Court. The court has handed out its highest ever fine to Qantas which admitted to breaching New Zealand’s Commerce Act by exchanging information with other cargo carriers to fix the fuel surcharge component of the price for international air cargo services. Malaria is not the only major threat for international travellers. Dengue and chikungunya are posting new threats for travellers to India, and unlike malaria, there are no vaccinations known to be effective for dengue and chikungunya. The number of UK travellers contracting dengue fever has doubled between 2009 and 2010, and the most reported cases were among British travelers visiting India. As many as 406 UK travellers in 2010 contracted the mosquito-borne infection in 2010, compared with only 166 reported cases in 2009, says the UK’s Health Protection Agency (HPA). The agency says that dengue fever is not present in the UK, and the most reported cases were associated with travellers to India – 84 cases. Other high risk countries for dengue fever are Thailand (61) and Indonesia (22). However, dengue fever is not the only infection to be worried about. There is a 34 percent increase in the number of British tourists reporting another mosquito-borne infection – chikungunya, which rose from 59 cases in 2009 to 79 in 2010. Again, about half of the chikungunya cases were associated with a visit to India. The UK does not have a system of active surveillance of dengue fever or chikungunya, so there may be more cases than reported by the HPA. HPA says while both diseases are endemic in Asia and Africa, dengue is more wide spread, and is common in South America, Central America and the Caribbean and the Western Pacific. Both the diseases are contracted through the bite of an infected mosquito. These are not contagious and cannot be spread from person to person. The common symptoms are similar to flu: sudden fever, muscle pain, headache and a rash. According to HPA, chikungunya can also cause joint pains that can persist for several months. However serious complications from dengue and chikungunya are not common in UK travellers. Which vaccination can I take? While malaria can be prevented by taking vaccination shots, unfortunately, there is no specific vaccine or drug to prevent or treat either disease. However, supportive treatment can help in managing symptoms. 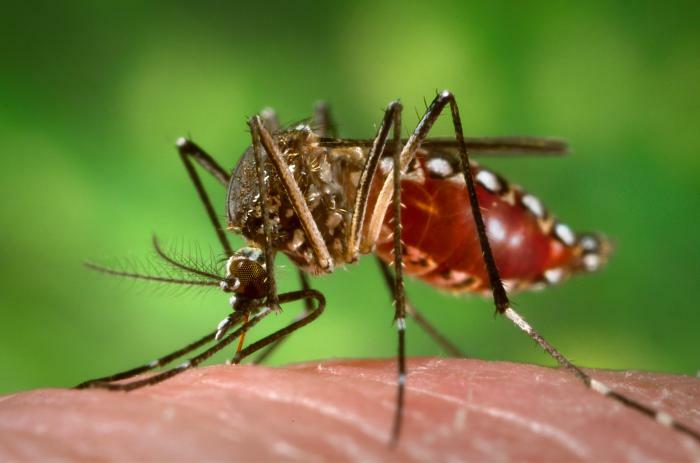 “These figures demonstrate that the importance of taking precautions to avoid mosquito bites extends to protecting against other infections, not just malaria,” says Dr Jane Jones, head of the HPA’s travel and migrant health section. What’s the difference between malaria, dengue and chikungunya? How to protect against dengue and chikungunya? The best protection against dengue and chikungunya is similar to that against Malaria – avoid mosquito bites. Apply insect repellents. A common brand in India is Odomos. Where malaria and other mosquito-borne illnesses co-exist, wear repellant all the time. Also use mosquito nets at night. Vaccinations against malaria and other illnesses need to be taken at least a month before travelling to a foreign destination. Travelling to India for the first time can be very overwhelming. From packing the right clothes for India, to getting the right vaccinations for travel to India, knowing Indian roads, Indian festivals, Indian Railways, it can be quite a daunting task not just for western travellers, but also for overseas Indians visiting India after many years. With a range of simple iPad Apps, planning your India trip has just got easier. Let The Global Indian magazine show you some of the best iPad Applications for travel to India, many of which are free. Any traveler to India will tell you how lost you can feel in this vast landscape that India is, where culture, language and climate changes every few kilometres. You will be lost without a comprehensive map of India, and could be easily taken for a ride by your taxi driver, or rickshaw driver. While there are many other map applications which are either cheaper or free, this iPad App is worth its price. Now, the most important and useful iPad App in this list is also the most expensive, but before we get to the price, let us show you the features. Mobile Maps by Sygic and MapmyIndia is a very comprehensive turn-by-turn, voice guided navigation software for your iPad and iPhone. The iPad app provides all maps with street level navigation in 400 cities across India, with free map updates. You can control the music and radio while navigating, and use its pinch-to-zoom feature to scroll naturally through menus. You can search for thousands of restaurants and other points of interest, with an option to call in, find parking, and navigate to. For its usefulness, $49.99 is a small price to pay. Indian Railways is the largest employer in the world, and has one of the most expensive railway networks going the breadth and depth of this vast subcontinent. If you are going places in India, you will inevitably travel by Indian Railways which offers a unique way to experience India’s diversity. This $1.99 iPad App lets you check running train status, seat availability check and PNR status for any train in India. (PNR is a ticket number issued by Indian Railways.) The iPad App integrates with the Indian Railways website, and lets you check running train status, seat availability for next 90 days, bookmark train Number, station and PNR numbers and search trains between stations. Download the iPad App. India is a melting pot of many regions, and the Indian calendar is full of more than 340 festivals and holidays. You will need to familiarise yourself with Indian festivals while planning your trip to India, so that you can either plan near a festival or away from it so as to avoid major rush. 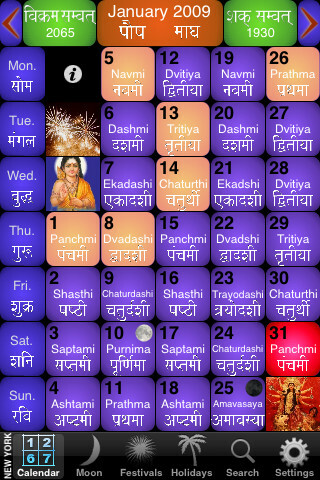 The Panchang (Hindi for calendar) shows India’s culture through the Hindu, Muslim, Sikh, Christian and civil festivals happening all along the year. Nearly all the festivals are illustrated with a colorful image. Download the iPad App for $0.99. If you are dining at an Indian restaurant and have no clue what to order, this iPad App will surely be your saviour. You don’t need to play it safe and order ‘butter chicken with naan’ every time you order at an Indian restaurant. Simply download this iPad App for $2.99 and let it help you negotiate most South Asian restaurant menus. 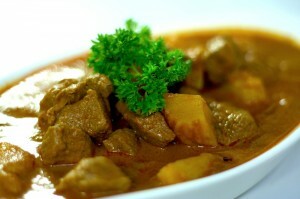 It will even give you an idea of the spices and ingredients that make up many popular Indian dishes. Just look up the alphabetical index, and you’ll be on your way to becoming an Indian food expert in no time at all! The App is written by Shaheen Bilgrami who was born in India and has lived in the US and the UK. She has been a foodie from an early age and enjoys cooking and eating good food from all over the world! Download the iPad App. India has 22 languages recognised by its constitution and has more than 500 dialects. While English is the widely spoken and understood in the main cities of the country, it is very helpful to know some local words for essential communication. This iPad App promises to teach you to “speak Hindi like a local with a tap of your Multi-Touch display, and master pronunciation of essential travel keywords and phrases from over 300 “talking translations”. If this sounds like too much of a task, you can simply flash your iPad or iPhone with the large type translations showcased on 75 cleverly designed flashcards. The best part of this iPad App is that it does not require internet connection, because the data is stored on the device. You can learn 500 most essential words and phrases and 300 high quality audio translations. It also contains reference menu readers, country tips, travel facts, size chart, calendar and numeral! Downoad the iPad App for $3.99. While New Zealand offers plenty of tourist attractions, its ethnic food variety is unmatched, especially in the multi-ethnic city of Auckland. Auckland’s central business district and the neighbouring Parnell and Ponsonby suburbs offer a rich choices for places to dine in, to suit all budgets. For a taste of Malaysian cuisine in the City of Sails, there’s a hidden culinary gems – The Mustard Seed Malaysian Restaurant. The restaurant was previously known as Bing’s Malaysian Restaurant. The Mustard Seed offers a range of ethnic Malay, Chinese and Indian influenced dishes which are essentially the core of Malaysian cuisine. If you love Indian food, then Malaysin cuisine offer a great variation to experiment. Owners Tommy Ning and Joni Hoang are keen to demonstrate the wonderful tastes Malaysian food can bring to Kiwi diners and Indian tourists. The Mustard Seed is a member of the Malaysia Kitchen Programme for New Zealand – a year-long campaign initiated by the Malaysia External Trade Development Corporation (MATRADE) to educate consumers about Malaysian cuisine and to encourage trial. 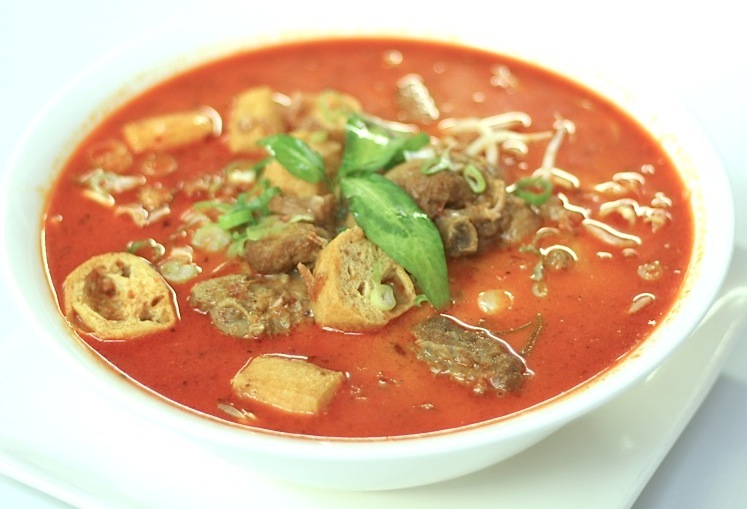 “We pride in serving authentic Malaysian cuisine and our three Malaysian chefs are very experienced in this space. “They specialise in char kuey teow, beef rendang, chicken and lamb satay, curry and lamb varuval,” Ning says. The Mustard Seed can sit 200 diners in a grand dome-shaped ceiling dining hall which is becoming rare sight in Auckland’s central business district. Next time you are out to try out ethnic food in New Zealand, you know where to begin. Immigrating to a new country is a major decision for immigrants, and choosing the right immigration attorney or immigration agent is very crucial, whether it for studying abroad, working abroad, doing business abroad, or moving permanently to a new country. Before hiring an immigration lawyer, you must decide whether you need an immigration consultant at all. Some countries have a very straightforward migration process and easy-to-understand immigration rules. Also, the immigration department of most countries are very friendly, whether you are immigrating to the UK, US, Canada, the Middle East, Australia or New Zealand. It is always useful to have a chat with an immigration officer of the country you are migrating to. Some countries have a very helpful website with plenty of information. The United States Citizenship and Immigration Services (USCIS) has a very extensive website which can be very valuable. Familiarise yourself with the immigration rules and processes on these websites. Complete online assessment forms to see whether you qualify for a student visa or work visa or permanent residency. Find out all the documents that will be required for getting a visa. If your case is straightforward, you may not need an immigration lawyer who are very expensive to hire. The money saved can be very useful during the initial stages of settlement. Of course, you may get overwhelmed by the immigration documentation, processes and the uncertainty involved in your visa application being processed. This can be very stressful and you may want to hire a competent immigration attorney. Here are a few tips that will help you find a good immigration lawyer, whether you are in the US (Miami, Atlanta, California), Canada, India, New Zealand or Australia. 1. References: Ask your friends and family who may have used an immigration consultant/attorney. You will be surprised to know how many people would have stories to share about their immigration lawyer. 2. If this does not help, then look up the yellow pages and contact a few immigration attorneys near you. Ask them for references, and speak to their past client to know what their experience. Ask a few immigration lawyers about their experience with your type of case. Find out how many years they have been helping immigrants. 3. Make sure the attorney is registered with a relevant industry body or legal establishment. Most countries require immigration lawyers to be registered with a government governing body. Speak to the immigration department of the country you want to migrate to. They can guide you about the registration and legislative requirements of that country for immigration attorneys. They may even be able to point you to the official website of the governing body. 4. Money: Find out the fees of a few immigration lawyers. Remember, just because an immigration agent is more expensive, does not mean he is good. At the same time, the cheapest immigration agent may not have the expertise for your work. But you must shop around. Find out the terms of payment too. 5. Attitude: Find out the working style of the immigration attorney. It is important that you feel comfortable working with this agent. 6. Finally, find out what the immigration lawyer is promising. If he sounds too good to be true, he probably is. Don’t get carried away by unrealistic promises – whether it is about the success of your case or the time frames. In fact, that is a dead give away of a fraudulent immigration lawyer. As they say in the law circle, Buyer Beware. Safe drinking water is a concern for travelers to India, including for Indians visiting India who prefer bottled water or distilled water in India. Contaminated water can cause a range of diseases, including diarrhoea, and spoil your well-planned trip. It can also result in hospitalisation and put unnecessary strain on your finances. Here are some tips to ensure that the water you are drinking in India is safe for drinking. Avoid tap water. Always drink mineral water or bottled water. Make sure the seal on the distilled water bottle is not broken. Also, buy bottled water from a reliable source. This is because there are rogue vendors who refill used mineral water bottles with tap water and sell them. Also check the product expiry date on the bottle. Avoid ice cubes in the drinks. Check the seal of the water bottle before buying it. While water purifiers are common in most Indian places, and mineral water is easily available, there may be places where you don’t have access to distilled water. In such cases, drink boiled water. Boiling water kills bacteria, parasites, and virus mostly responsible for diarrhea. Boil water at least for a minute. Let it cool naturally. Do not add ice. If you are at a hill station at higher altitudes, then let the water boil for five minutes. If it is not possible to boil water, it is then important to know some water treatment or water purification methods, while you are in a country where water pollution is common. Here are some common water purification methods you can use while in India. Iodine is the best way to purify water. Some common iodine products available in the pharmacies are Globaline, Potable-Aqua, or Coghlan’s. However, iodine tablets or liquid iodine may not kill the parasite that causes diarrhoea (cryptosporidium) and other coccidian parasites like cyclospora and toxoplasma. Also, if the water is below 5 degree celsius, try to warm it before putting iodine in it. Iodine takes about 30 minutes to work in normal temperature. In colder weather, allow water to stand for longer time. Some tourists also use crystalline iodine. They are durable and you can make your saturated solution from the crystals. You can then use the solution to purify water. WARNING: Crystalline iodine (4 to 8 grams) can be fatal if swallowed in a single dose. You can also use water bottle filter. However, some water filters may not remove all the viruses. For example, some water filters have pore sizes of 0.1 to 1 micrometer and can remove bacteria that causes diarrhea. However, viruses are smaller than 0.1 micron and will not be removed by these filters. To kill these viruses, add iodine to the water once it has been filtered. Chlorine is also effective for water purification, but it is not as effective as iodine. 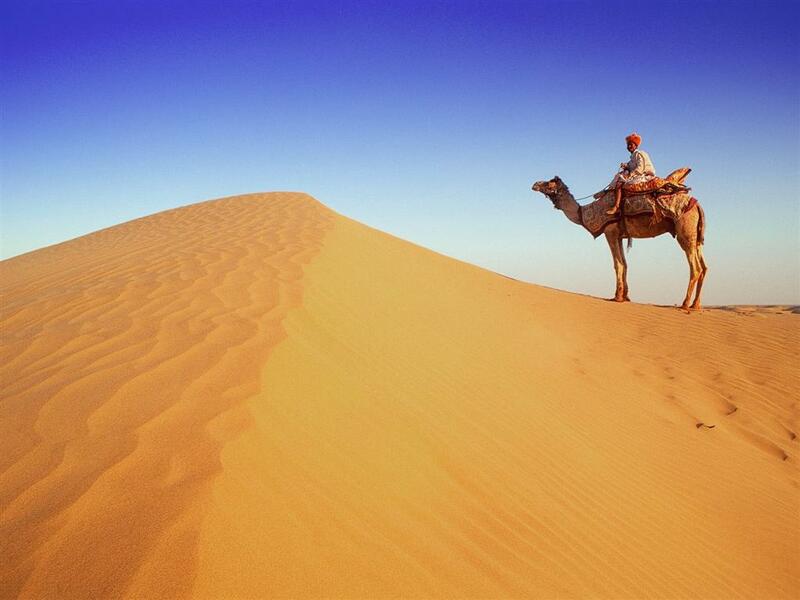 Have you thought of immunizations and vaccinations for travel to India? Tourism in India is on the rise. The Incredible India campaign is getting everyone – foreigners and Indians alike – excited about visiting many tourist places in India. However, travellers should be aware of health issues and concerns in India. Tourists can be prone to many illnesses in India including diarrhoea, malaria, yellow fever, dengue fever, hepatitis and typhoid. Tetanus injections and shots for travel to India are very important before travelling to India. Travellers must understand how vaccinations work, whether travelling to the capital city of New Delhi, lush green Kerala, seaside Goa, or the dessert of Jaipur. India presents a high risk of food-borne, water-borne and other infectious diseases such. “We encourage you to consider having vaccinations before travelling,” says a travel advice by the Australian government. Malaria: Malaria is a common illness in most cities of India. Malaria is caused by mosquitos breeding in stagnant water. The risk is especially high during the monsoon months of May to November. There are other mosquito-borne diseases such as chikungunya fever and filariasis. Malaria is a bacterial disease and effective shot is prophylaxis. Check with your doctor. Even with vaccination, travellers should protect themselves from mosquitos. A common mosquito repellent in India is Odomos. Alternatively, avoid mosquito-prone areas. Wear loose, light-coloured clothes. Typhoid: This is a bacterial disease transmitted through water or food. There’s oral or needle vaccination available. It can be treated with antibiotics.Hepatitis A and B: This is a virus and it affects the liver. Hepatitis B is transmitted through blood and hepatitis A through contaminated water and food. Fortunately there is vaccination available for both Hepatitis A and B with one shot. Diarrhea: This is very common among foreign travellers, and is often described informally as Delhi belly. Mostly contaminated water or food causes diarrhea. It can also be caused by spicy Indian food. Make sure you have oral rehydration salts with you, or you can buy them from a local chemist. A common brand of oral rehydration is Electrol, or ask a doctor. You can also take anti-diarrhea medicine like Immodium. Buy your drinking water bottle from a good shop and check that the seal on the bottle is not broken. Eat freshly cooked food. Avoid ice cubes. Dengue fever: There is seasonal outbreak of dengue fever in New Delhi and other parts of the country. Unfortunately there’s no effective vaccination available because dengue is a virus. Avoidance is the best cure. Use a mosquito repellent with DEET. Japanese encephalitis: This is a mosquito-borne disease and its most reported cases are found in the northern state of Uttar Pradesh. Many countries have vaccinations for Japanese encephalitis. Check with your GP. Tetanus: Tetanus is also a bacterial illness transmitted through animal faeces. Though less common, tetanus very uncomfortable. Travellers should immunize with vaccination. Avian influenza: The risk of avian influenza is high for long-term travellers, not so much for brief visitors. It is important to take influenza antiviral medicine under medical supervision. Many foreigners and Indians also visit India for medical tourism, which is a form of visit with the intention of undergoing medical treatment in India which is mostly cheaper. Travellers must do their research before receiving treatment from a medical facility in India. While the country has some of the best medical and hospital facilities, there are many medical treatment providers which offer very poor quality treatment. If the treatment results in health complications in India, the cost of revacuation can be very high. “Medical evacuation costs could total in excess of AU$300,000 depending on circumstances,” says the Australian government website. Also, if a traveller develops adverse symptoms on return to their home country, they have little recourse against the overseas treatment provider. This advice is for information and should not be used in place of medical advice. Please consult your doctor.